Care for some unique, anyone? 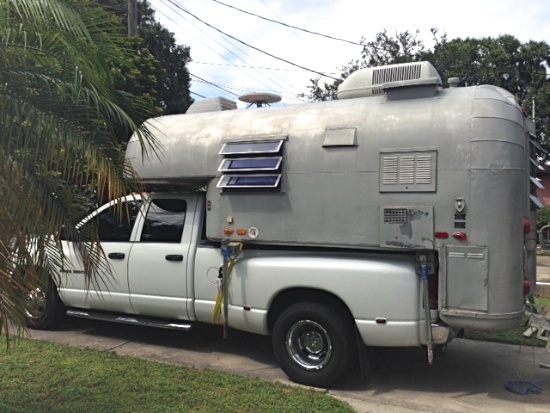 Reader David R sent in a couple of photos of his latest conquest, a 1965 Avion C-10, a ten-foot truck camper that fits in an eight-foot bed. He claims it’s “in surprisingly good condition for the age”, which is now fifty years! Who says they didn’t build ’em to last back then? David is one of those gluttons for punishment who enjoys taking basket cases and refurbishing them, and then on to the next. But it’s possible that this old 1,700-pound beer can might stick around for awhile, since it’s roomier all around than the newer refurb that he has now. With its aluminum structure still intact, only the wood-trimmed interior needs attention. He says that it’s usable right now, as-is, and admires its build quality. “This one may be my keeper, we will see,” he wrote. There are a few snags to be dealt with, though: he’s still trying to figure out how to get access to his Dodge’s spare tire release mechanism, which the Avion now neatly covers. 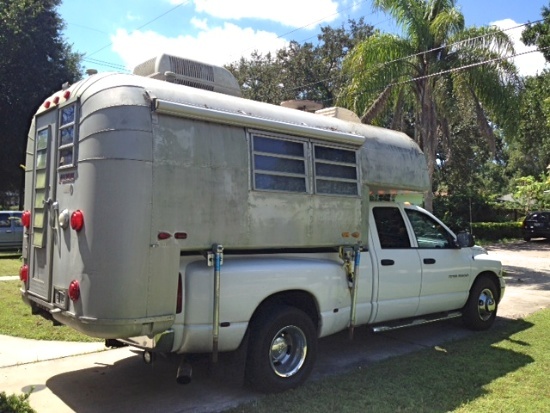 He also likes to tow a motorcycle trailer every now and then, and what with all that camper overhang, he will require a long hitch extension that will greatly magnify the effects of tongue weight on the truck. This thing generates a few different aspects of Wow. Me, I was hoping that he’d spend the next few years of his life polishing up that aluminum exterior. If he were willing to burn out three electric polishers and wear through a couple thousand pads, that mirror finish would look stunning! But David told me no-can-do: Avion used anodized aluminum, which is one more reason this thing is still intact. It protects the aluminum, and can’t be buffed through. So battleship grey it must remain. Considering the man-hours it would take to polish it up and all those seams, that’s actually good news! It is, JR. It’s a wow in my book. Looks a little like a 3/4-ton armadillo, and I mean that in a nice way! Doug,,,well what do you know, I think you may have just given us a name for that beauty, We had toyed with Gemini, The name of the space ship launched in 1965. Merely a thought. I’d comment, but I don’t want to influence you either way. And you may come up with something entirely different later! There are still plenty of those that come up for sale on Craigslist. Avions were built to last and although he won’t get a mirror finish there are still a lot of things he can do to make the aluminum almost like new again. Those are great and they made travel trailers for years and years also. Thanks for that, Camilla. Seems like some of the upper-end motorhome manufacturers were once in the TT or truck camper market prior to the collapse. As for restoring, I’m intimidated by the sheer acreage of aluminum here when it comes to handwork, but David is a self-admitted glutton for punishment, so anything goes! There is a pleasure in bringing serviceable things back to life. Armadillo works for me, too. While I like the idea of shining up the shell I’ve never seen a shiny armadillo so naming it that would provide an excuse to not shine it. Abundantly helpful reasoning there, Linda.